The teachers actively participated in the different exercises on phonemic awareness, comprehension and thinking skills. They were not timid at all. They were very thankful for the many things they learned from the workshop that they can use to teach reading to their Grades 2 to 6 students. During the break-out session, Dr. Guevara asked them to create something that would summarize their experience in the whole-day training. 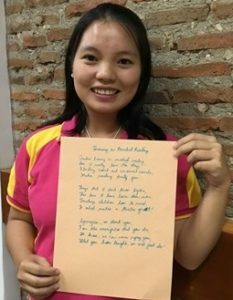 One of the participants, Grade 3 Teacher Laila Supanga Kawain of Lon-oy Elementary School wrote a poem on how she felt about the training, what she learned and what left a mark in her from her experience. Teacher Laila explained that she saw her co-teachers were cutting pieces of colored paper to come up with art pieces. But she was not very good in art work. So she wrote a poem to express how much she has learned and appreciated the training. She said blending of sounds and the techniques to teach it are what she would use to her students. Through her poem, she wants to show her gratitude to Synergeia and to EdGE, and wishes for another training in the future. This time, I have learned them now. Is what makes a teacher great! We know we can never repay you. What you have taught, we will just do!